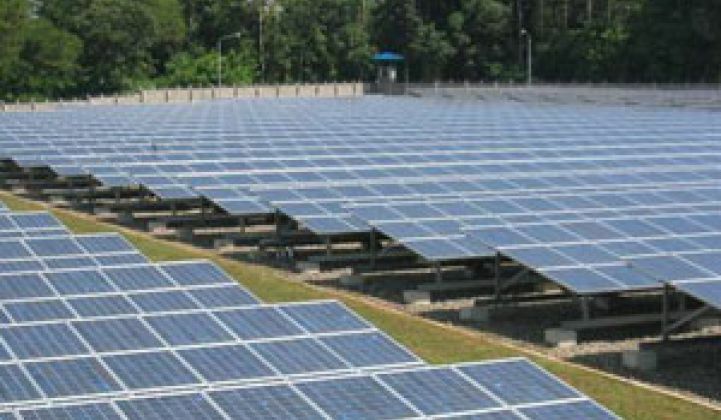 The utility has made a long-awaited announcement that it plans to develop 250 megawatts of photovoltaic solar projects that it will own itself, along with another 250 megawatts to be built and owned by independent developers. Pacific Gas & Electric Co. is getting into the solar business as an owner. The utility announced Tuesday a $1.4 billion plan to build, own and operate 250 megawatts of photovoltaic solar power plants – part of a 500-megawatt solar power initiative it hopes regulators will approve this year. With this move, PG&E joins fellow utilities Southern California Edison, Duke Energy and Public Service Electric and Gas Co. (PSE&G) in entering the solar power field as owners of their own plants (see California Solar Rooftop Project Hits Milestone). Traditionally, utilities have sought third-party developers to build and own solar power plants and provide power to utilities under long-term power purchase contracts. PG&E's Tuesday announcement did include plans to open half of the 500 megawatts of solar panels it wants to deploy by 2014 to independent developers. The utility filed its proposal with the California Public Utilities Commission on Tuesday. But the economic downturn – along with a new provision of federal law allowing utilities to receive tax credits for solar power projects they build themselves – has prompted utilities to take the dive into solar ownership. A renewable energy package passed by Congress in October for the first time allowed utilities to access to a 30 percent investment tax credit that used to be available only to independent solar power developers (see Utilities to Hit Solar Scene and Lawmakers Approve Energy Tax Credits, Bailout). At the same time, those independent developers have seen funding for their projects dry up amid an economic downturn that has bankrupted some traditional renewable power project investors and led many others to curtail investment (see Tax Credit Fix for Solar in Works and Lehman's Fall to Create Greentech Woes). "There are challenges in the capital markets where young developmental firms are unable to get the capital they need to build out their projects," Peter Darbee, PG&E's president and CEO, said Tuesday at a press conference in San Francisco. PG&E's $35 billion balance sheet – and the fact that it is still earning taxable income that can be offset by the credits – leaves the utility "well positioned to step up" to meet those gaps in financing, Darbee said. In fact, PG&E is worried that some of the independent solar power developers it now holds contracts with may not be able to fulfill their commitments because of the lack of private capital, Darbee said. PG&E plans to press for renewable energy project loan guarantees set aside in the federal stimulus package signed into law last week to be made available to those projects to make sure they are completed, Darbee said (see Obama Signs Stimulus Package). PG&E will also look at the possibility of providing financing for those projects to keep them on track, Darbee said, though he did not offer specifics. "We see this as a fundamental strategy to assure ourselves that we meet the requirements of the state" that PG&E and other investor-owned utilities provide 20 percent of their power from renewable sources by 2010, he said. PG&E has been mulling over investing in its own solar power plants for some time (see Is a PG&E Solar Rooftop Investment on the Horizon? ), but Tuesday was the first official unveiling of its plans. PG&E hopes to finance the $1.4 billion project by raising ratepayers' power bills by about 1 percent, or an average of 32 cents, Darbee said. The utility plans to develop projects in the 1-megawatt to 20-megawatt size, and will try to build them on its own property where possible to reduce permitting challenges, he said. PG&E also will try to build as many projects as possible close to distribution substations limiting the need for additional transmission capacity, he said. The utility plans for most of its panels to be ground-mounted, he said. Darbee did leave open the possibility that PG&E would look to seek regulator permission to own solar-thermal or other utility scale projects in the future, saying that the utility may be filing another application with the CPUC in the coming weeks. Other utilities have had mixed success getting regulators to approve the utility ownership model. Duke Energy's $100 million plan to install 20 megawatts of distributed solar panels got cut in half by the North Carolina Utilities Commission (see Duke Chops $100M Distributed Solar Project in Half), leading the utility to threaten that it couldn't make the smaller-scale project work financially. Southern California Edison's $875 million plan to put 250 megawatts of solar panels on two square miles of rooftops has drawn the ire of some solar power developers who say the utility is taking unfair advantage of its ratepayers to do projects independents could do more cheaply. Those opponents have made their objections known to the California Public Utility Commission, which is set to rule on SCE's plan soon. Some opponents have asked the commission to halt the project, while one group has asked that SCE let independent developers do half of the 250-megawatt project. Fong Wan, senior vice president of energy procurement for PG&E, did say that PG&E had designed its program to avoid some of the objections that SCE has faced. Opening up half of the 500-megawatt initiative to independent developers was one such concession, Wan said. Also, PG&E plans to mount most of its self-owned panels on the ground, leaving rooftop solar projects mostly open to independent developers. PG&E has also opened up a bidding process for companies that want to supply its solar panels, Wan said. He wouldn't say which solar panel producers have responded to the utility's request for information. PG&E plans to have a 2-megawatt pilot project up and running in 2010, and have 25 megawatts of power-producing panels in place by the end of that year, Wan said. The utility will then install 50 megawatts per year in 2011 through 2014, and finish with 75 megawatts in 2015. "We expect the cost of photovoltaic panels to come down fairly dramatically over the next few years," he said. The view is shared by many industry analysts. PG&E is calling for its self-owned projects to cost $4.28 per watt of solar panels installed, Wan said. The utility may hire contractors to build the projects or choose to build them on its own. "We have not made a decision as to how to do this," he said. PG&E intends to finance half of the overall project's costs through debt, and the other half with equity from internal cash reserves or the issuance of common stock, he said. While some independent solar power developers may object to another utility entering what they see as their market, PG&E's owner-operator play did get the support of some solar power industry groups, including the Solar Electric Power Association. PG&E will streamline the process for independent developers of the 250 megawatts to be built and owned by others by offering them contracts with pricing derived from the utility's own costs, the association noted.